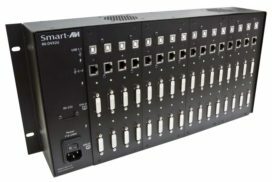 SmartAVI's Rackmount DVI Extenders offer industrial-grade extension built to fit into rack-mounted storage. 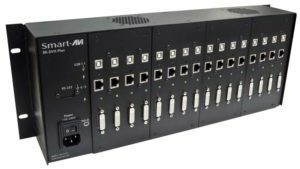 These powerful extenders are capable of sending 1080p (1920x1080) resolution video to output displays hundreds of feet away from a signal's source, making it the perfect way to bridge gaps between large-displays and video sources. 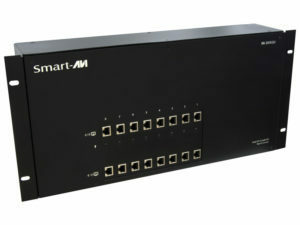 16-port, rack-mountable DVI-D/USB extender with a range of 275 feet via CAT5/6 STP cables; KVM extension functionality. 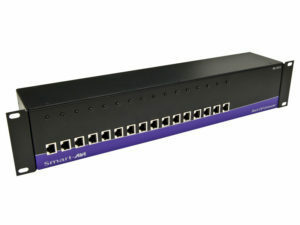 8-Port Dual DVI-D, Audio and USB 1.1 Extender up to 225 feet over 4 STP cables. 16-Port Dual DVI-D and USB 1.1 Extender up to 325 feet using CAT5 cable.